Tobi was formerly Zetsu's subordinate, and became a full Akatsuki member after Sasori's death. He now wears the same ring as Sasori, having recovered it after Sasori's death, and took his place as Deidara's partner. Unlike the majority of ninja thus far, Tobi has not been shown wearing a visible forehead protector, so his place of origin is unknown. He wears an orange mask with single eye-hole covered in a swirl pattern concentrated towards the right eye. This odd mask that covers his entire face save for his right eye. Furthermore, Tobi has several bolts or pins present on the arms of his uniform, now obscured by his Akatsuki cloak. Tobi's area of expertise remains unclear, as he has never been shown fighting. He and Deidara have defeated the three-tailed beast, but Tobi is never shown doing anything but running from it. After the battle, which goes largely unwitnessed, Tobi claims to have knocked it out with a single attack. Deidara disagrees with the assessment, claiming that it was his "artistic contribution" (exploding clay) that allowed them to win. During his fight with Sasuke, Tobi shows the ability to recover from what are presumably debilitating or fatal blows. After being slashed across the midsection by Sasuke's sword, Tobi collapses, only to stand up again a few seconds later and complain about the speed of the attack. Aside from this, Tobi has yet to demonstrate any techniques. Tobi has a very formal and correct manner of speech. While his physical appearance remains a mystery, Zetsu has implied that he is relatively young when one side of him referred to Tobi as a "good boy." He respects Deidara, referring to him as Deidara-senpai. Tobi's personality is rather odd in comparison with other Akatsuki members. While most of the members are dedicated and serious, though somewhat argumentative or even hostile towards each other when not fighting, Tobi is more carefree and goofy, much like Naruto. His personality does not please Deidara, who believes that all Akatsuki members should be serious and calm. Tobi unintentionally irritates Deidara frequently, which usually results in Deidara attacking Tobi in a comedic fashion. However, after Deidara and Itachi's death he is later seen and heard with a more serious and calm tone in his voice. The carefree side of Tobi is not seen again. 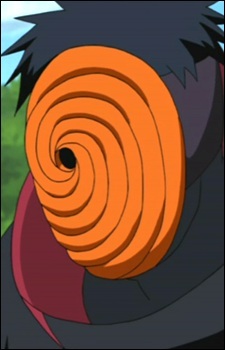 Later Tobi claims to be Uchiha Madara, the founder of the Uchiha clan and first mangekyo sharingan user. He later changes his mask after obtaining the rinnegan to allow him to use both eyes simultaneously. In fourth ninja war, when he meets Naruto and Bee he says to be no one and that they could calling him Tobi, Madara or No One. In chapter 599, it is revealed that Tobi is actually Obito Uchiha who was teammates with Kakashi Hatake and Rin under the Fourth Hokage. Obito got his right side crushed when he saved Kakashi by pushing him out of the way of a rock slide. Unable to escape with his teammates, Obito had Rin implant his remaining Sharingan eye in Kakashi's damaged eye socket as a gift. After that it was believed that Obito died. Masks are worn for a variety of reasons－protection purposes, fashion, to hide one's identity, and so on. This goes for anime characters as well. The mysterious allure of their secret identity is something of true beauty. Let's check out some of the most iconic anime masks in existence! Naruto is one of the more complex Shounen anime, which is why there are so many great Naruto AMVs out there. There's a lot of material to work with. Maybe too much. But we were able to find the top 10!